Gold Prospecting in California. Panning and Mining for Gold in California. Everyone knows that California is famous for its rich gold deposits. Ever since the initial discovery of gold at Sutter's Mill in 1848, there have been thousands of gold seekers exploring California in search of the yellow metal. The California Gold Rush was by far the most significant gold discovery in the United States, and the state remains one of the top gold producers in the country. Fitting all that information into one short article would be an impossible undertaking, so instead we will focus on some of the more general parts of California that are known as rich gold country. 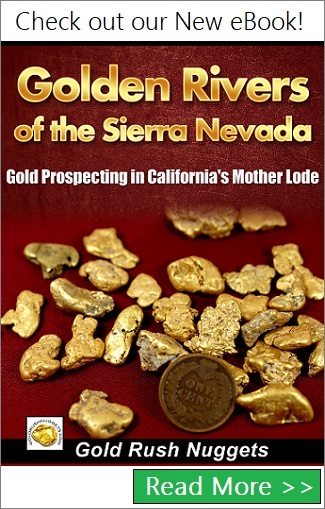 Once you have keyed in on a specific area that you want to go, it is highly recommended that you purchase one of the many books about gold prospecting in California for more in-depth information on where to mine for gold. The most famous gold region is the Mother Lode Country in the north-central part of the state. It consists of a region that spans approximately 150 miles from north to south along the western slopes of the Sierra Nevada Mountains. It includes much of Amador, Calaveras, El Dorado, Mariposa, Nevada, Placer and Tuolumne Counties. Major river drainages include the American River and Feather River. The original discovery of gold near present day Coloma, California, and the area has been producing gold ever since. The major river drainages have been prospected hard over the past century and a half, but high waters refresh placer deposits every year. There are literally thousands of small streams, gulches, bench deposits, and lode prospects throughout the Mother Lode country that will still produce gold today. Another extremely rich prospecting area in the state is the Northern California goldfield that covers much of Siskiyou, Shasta, and Trinity Counties. Gold nuggets were discovered here in 1851, and brought many prospectors from the Sierra Nevada Mountains north to the Trinity Mountains in search of gold. The Klamath and Sacramento Rivers have both produced huge amounts of placer gold, as well as much of the surrounding drainages that feed them. Much like the Mother Lode Region, there are thousands of areas to explore that have produced gold in the past. Many areas were mined using hydraulic methods, as well as hand placering and hard rock mining. The richness of this goldfield extends north into Southwest Oregon, where much gold has also been discovered. Although largely overshadowed by more well-known gold discoveries in the northern half or the states, many parts of Southern California also produce gold. In fact, gold miners of Spanish and Mexican origin were mining this region prior to the more famous gold discoveries to the north. Gold has been found in Los Angeles County in the San Gabriel Mountains. Kern County has also produced over 2 million ounces of gold, much from lode deposits, but some placer as well. San Bernardino County is the largest county in the U.S., and numerous mines can be found here. The Dale, Holcomb, Silver Mountain, and Stedman Districts were all producers. Many small prospects have been worked here, but extreme temperatures and lack of water to work the dry placers limited much of the historic mining. In the far south, Riverside, Imperial, and San Diego Counties have also produced gold. California is one of the most mineral rich states in the U.S. Unfortunately, current mining regulations and restrictions have had a huge impact on the current industry, from large mining companies down to the small-scale prospector. Despite these challenges, excellent potential that still exists for prospectors in the state. 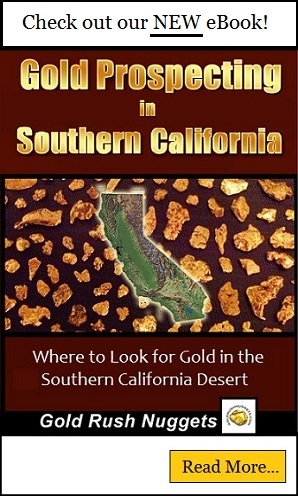 For additional information about gold mining in California, check out our recommended reading page. You can also read additional information about gold prospecting various locations in California by exploring the links below.